Laparoscopy is direct visualization of the abdominal cavity using an operating telescope. The laparoscope is a long thin instrument with a light source at its tip, to light up the inside of the abdomen or pelvis. Fibreoptic fibres carry images from a lens, also at the tip of the instrument, to a video monitor, which the surgeon and other theatre staff can view in real time. Carbon dioxide (CO2) is put into the abdomen through a port that is inserted just below the navel. This gas helps to separate the organs inside the abdominal cavity, making it easier for the surgeon to see the organs during laparoscopy. The gas is removed at the end of the procedure. 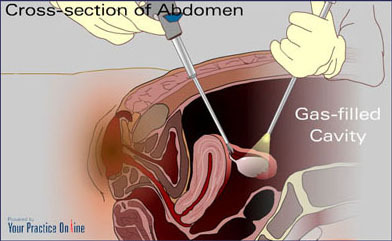 Gallbladder surgery - most gallbladders are removed using laparoscopy and keyhole techniques. Liver biopsy – patients with a variety of liver disorders may require a liver biopsy which can be taken at laparoscopy. Some liver resections can be performed with keyhole surgery. Pancreatic tumours – some pancreatic tumours can be removed with laparoscopy and minimally invasive techniques. Adrenal tumours – the majority of adrenal tumours can be removed with laparoscopy. Stomach tumours – some stomach tumours can be removed via laparoscopy without a major incision. Spleen removal – there are some uncommon conditions that can be treated with removal of the spleen. This is most commonly done with laparoscopy and keyhole techniques. Below are common topics related to laparoscopic surgery. Click on the topic to find out more.